It’s 5pm and I’m standing in my kitchen, one hand on top of the baby’s head, the other flipping fish. My daughter is talking nonstop about something—whether purple Tylenol is better than red, I think—and through the kitchen window I can see my oldest son taking out the trash. It is normal. It is dinnertime. Over the mosquito-drone of children’s ceaseless chatter, I hear the story on the radio and the room begins to spin. I cannot hold back tears, and I barely keep from retching. I’m unsure how the world continues to turn in the face of such news. On Tuesday, twenty-five-year-old Farzana Iqbal was bludgeoned to death by twenty members of her family outside of a Pakistani courthouse while bystanders and police looked on. Farzana was three months pregnant. Her killing and ritual humiliation were done for family honor, they said: Her husband had paid for her, but the family wanted more money and the husband refused to pay. Some stories say she was killed for marrying a man she loved. Yesterday her husband acknowledged that he had strangled his first wife so that he could marry Farzana. For that crime he spent one day in jail. The fish begins to burn. My daughter becomes frustrated by my lack of “oh, reallys?” and smiling nods. But with this news I am unsure how to continue functioning. Surely we must stop everything and change this? How can I shred lettuce, mix salad dressing, talk about my daughter’s new T-ball glove? Surely it is wrong to keep moving. 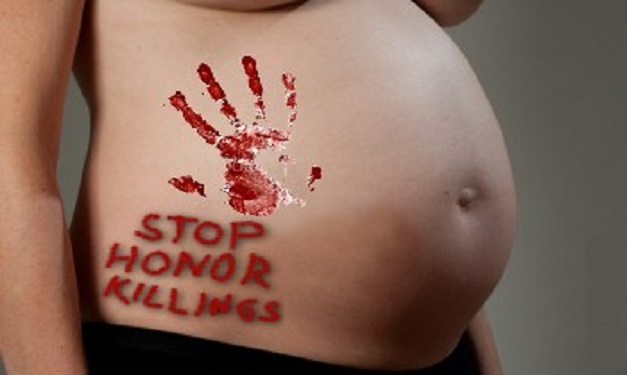 Farzana is but one of about 1000 honor killings that take place each year in Pakistan. When I went online to read more about her life and death, I saw a related news story reporting that two teenaged girls—ages 14 and 15—were added to that number yesterday, but not before they were gang raped and strung up on a tree to die. The articles—deeply-buried under stories of Kate Middleton’s bare bottom and the Reading Rainbow Kickstarter—say that Farzana’s family felt they had to kill her—she had dishonored the family by giving herself to a man of her choosing. Last week, Elliot Rogers went on his own honor-killing spree, claiming girls should have chosen him. Some die for choosing, others for not choosing. But they all die because they are women. Rogers was mentally ill, and there is debate about whether it was his illness or a misogynistic culture that caused his rampage. For Farzana’s family, and for the 1000 Pakistani girls and women who die each year in the name of honor, there is no question. This morning I perused Forbe’s recently-released list of the top 100 most powerful women in the world. I am struck by their high-powered jobs, their massive earnings and earning-potential. I’m curious where Mother Theresa would have fit on that list. Where Farzana would have been. #12? 27? What about the 13-year-old girl whose double-take of a young man on a motorcycle caused her parents to kill her with acid? Their deaths, the message behind their deaths, have shaken me to my very core with the power that they wield. I am breathless and overcome with the enormity of their weight. Do you feel it too? Power in surges and waves that crash over us in our kitchens, our cars, in the snippets of news we catch between Dora episodes. The strength is there, inviting us to the harvest until our stores become so full we simply can’t hold any more and we must share what we’ve gathered with the world. For now, the day is about to begin; the children are sleeping late but will soon be awake, and I must remove one hat and don another. Because as hard as it is, I know I must keep moving, keep cooking dinner, keep smiling and nodding at endless chatter. Keep finding my balance on a spinning world. This entry was posted in The Absurd, The Faithful and tagged Elliot Rogers, honor killings, womanhood. Bookmark the permalink. I’m with you, Jamie, but it’s not just about women and take care not to blame men alone. We are beginning to see here what happens when violent women or those who favour violence against men get the upper hand. I think Tim should take another look at what is “normal” closer to home, and I don’t just mean the damage to ears, brains, and lives exacted by psychiatrists who haven’t a clue what they are doing (Isla Vista’s tragedies being only the latest in a long litany of Rx-related murders and suicides). The men like Eliot Rogers who go on killing sprees here are not products of misogynous thinking due to their socialization. They were fragile minds who have become demented as victims of their physicians, female and male, who should be held to account for what happens to their patients when they ingest their prescribed psychoactive chemicals. The physicians can in turn sue the drug companies. I am also reeling with the news that our youngest son is about to go to jail for crimes he did not commit under a relatively new law that allows women to lay charges of assault without proof. The reverse of the revolting situation under Muslim law, under this feminist-inspired Canadian law a man is presumed guilty until he can prove himself innocent. His is far from an isolated case. The plight of these mostly young men is exacerbated by the alleged misandry among employees of an agency for children allegedly stacked with lesbians who coach those abusive young women on how most effectively to continue to put the screws to their ex-partners–through the children. I found that a bit of a stretch until I saw signs of it myself. A men’s group in Ottawa is keeping data on attorneys, judges, judgements; and is recommending attorneys who have shown themselves to be not prejudiced against men. According to their data, some judges are finding consistently against men despite statistics that show women are as frequently violent against men as men against women. Furthermore, they have evidence that some prisoners are being physically assaulted by staff after they have been unjustly incarcerated. The Canadian Association for Equality, recently formed for the education of the public on men’s issues and for the support of boys and men, has been violently protested by feminist groups, but also by mixed groups of students who have bought into a bizarre view of women in this country as “oppressed.” There are rare “Farzanas” here persecuted and murdered by their Muslim families from communities where vigilance and teaching is needed. But the rest of us? By any global standard we are favoured women and remain so because we raise gentle men. A strident minority has perverted the law when we were not paying close enough attention; our family members are paying dearly for some women having been allowed get their own irrational, unjust, violent way. I’m so sorry to hear what your family is going through! My prayers are with you and your son. I agree that violence and prejudice from anyone — male or female — is an atrocity. We sadly live in a fallen world and the evidence of that is around us, painfully, daily. I wasn’t aware that there was an issue over Rodgers Rx… I need to look into that; I’m curious to know what is being said on the issue and what medication he received. The ABC interview http://www.deadline.com/tag/elliot-rodgers/ of the family friend Simon Astaire revealed that Elliot, who had been in counselling since the age of 9, had been on Xanax for the past six months. The family was worried that Elliot might be suicidal. The family friend describes a severely depressed boy. He had been prescribed another unnamed medication; whether or not he took any of it was not mentioned but he had refused to take it on a regular basis. Thank you, Amy. I’m glad we’re in this fight together. Jamie, some people try to say that the way things are in other countries is normal for them and we should accept their ways of life. We should do nothing of the kind when it comes to horrors like the ones you’ve mentioned, including our own society’s failure to change the culture that leads to tragedies like the one in Isla Vista last week. Yep, some people do say that. Some people say a lot of things. There are, admittedly, things we must not/should not mess with that may not jibe with our way of thinking. To me it’s clear this is not one of them. Regarding UCSB… I am simply speechless. Well, no, I’m not. But I’m a bit nervous to say my feelings. There seems to be more of a delicate balance to the issue than one would think. I’m pouring cereal, listening to the chatter, finding lost shoes, and reading this out the corner of my eye. And I’m apalled and spinning too. I’m sorry. But then again, I’m not. : ( I am so thankful God gave us words.